We would like to welcome you to our cultural experience classes! In our caregiver participation class, young children are introduced to African songs, games, percussion instruments, music, drumming and African themed stories in a highly energetic class. Toddlers will develop self awareness and rhythm as well as pick up some African language from word play through song. Bring your tot and come boogie with us, African style! "Simply the most enjoyable music class for both kids AND parents this side of the Indian Ocean"
"...Some musician dads observed Catherine’s method of call and response is intuitive to young kids and not condescending like nursery rhymes (yawn) to parents. (Translation: everyone enjoys.)" Learn African culture through dance this weekly class that offers a combination of dancing to live drumming or music on CD. This class is open to all levels, so come on down and shake your tail feather as you pick up some traditional African movements. 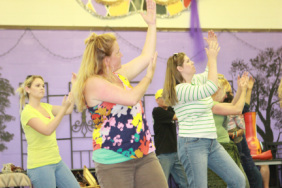 We will feature surprise guest teachers in some classes, so your best bet will be to come to all the classes! The first series of classes start on March 11th and will be every Tuesday from 7:30PM-8:30PM. Check back this space for registration information. Join us at the Bothwell Arts Center every Monday, starting March 10th from 7:30-9:30 for an African drumming class with Mogauwane. This is a mixed ability class where all levels of drummers are welcome. 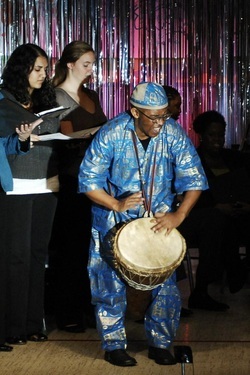 Come explore the joy of African drumming and learn some rhythms of Africa. Bring your drum or borrow one of ours. About the Instructor: Mogauwane Mahloele was born in Storomo and raised in Mamelodi ya Tshwane, South Africa. He was born a drummer, and learned to master his instruments through countless hours observing, participating, practicing, rehearsing rhythms and making the instruments to fully understand their capabilities. He is of the BaPedi people, known for their versatility in music instrumentation. Among Mogauwane`s mentors, Tshidi, Kasi and Lefes were especially important in impressing upon him not only technique and particular rhythms and music, but also a deep seriousness in ethics and aesthetics of the culture, social structure, and the history of both family and the nation. Mogauwane was born and raised under the apartheid system and worked to see it dismantled. These struggles frame his music, and his soul. Mogauwane has been playing music since his days in the warmth of his mother`s womb. His mother was a traditional dancer, and he too danced, even before he was born. His music is traditional and traditionally inspired, and has been his lifeblood for more than 40 years.